This paper studies carrier frequency offset (CFO) estimation in the uplink of multi-user multiple-input multiple-output (MIMO) orthogonal frequency division multiplexing (OFDM) systems. 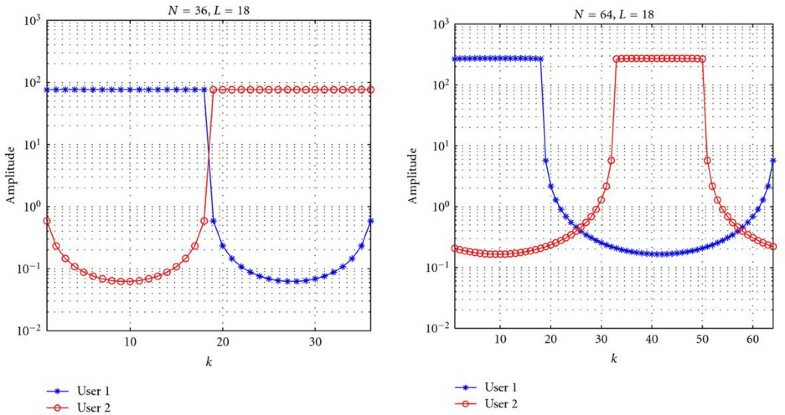 Conventional maximum likelihood estimator requires computational complexity that increases exponentially with the number of users. To reduce the complexity, we propose a sub-optimal estimation algorithm using constant amplitude zero autocorrelation (CAZAC) training sequences. The complexity of the proposed algorithm increases only linearly with the number of users. In this algorithm, the different CFOs from different users destroy the orthogonality among training sequences and introduce multiple access interference (MAI), which causes an irreducible error floor in the CFO estimation. To reduce the effect of the MAI, we find the CAZAC sequence that maximizes the signal to interference ratio (SIR). The optimal training sequence is dependent on the CFOs of all users, which are unknown. To solve this problem, we propose a new cost function which closely approximates the SIR-based cost function for small CFO values and is independent of the actual CFOs. Computer simulations show that the error floor in the CFO estimation can be significantly reduced by using the optimal sequences found with the new cost function compared to a randomly chosen CAZAC sequence. Compared to single-input single-output (SISO) systems, multiple-input multiple-output (MIMO) systems increase the capacity of rich scattering wireless fading channels enormously through employing multiple antennas at the transmitter and the receiver [1, 2]. Orthogonal Frequency Division Multiplexing (OFDM) is a widely used technology for wireless communication in frequency selective fading channels due to its high spectral efficiency and its ability to "divide" a frequency selective fading channel into multiple flat fading subchannels (subcarriers). Hence, MIMO-OFDM is an ideal combination for applying MIMO technology in frequency fading channels and has been included in various wireless standards such as IEEE 802.11n  and IEEE 802.16e . 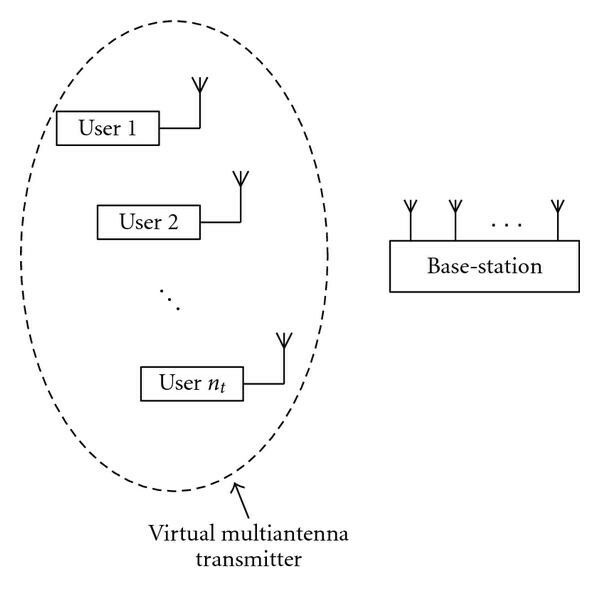 An extension of the MIMO-OFDM system is the multiuser MIMO-OFDM system as illustrated in Figure 1. In such a system, multiple users, each with one or multiple antennas, transmit simultaneously using the same frequency band. The receiver is a base-station equipped with multiple antennas. It uses spatial processing techniques to separate the signals of different users. If we view the signals from different users as signals from different transmit antennas of a virtual transmitter, then the whole system can be viewed as a MIMO system. This system is also known as the virtual MIMO system . Overview of multiuser MIMO-OFDM systems. Carrier frequency offset (CFO) is caused by the Doppler effect of the channel and the difference between the transmitter and receiver local oscillator (LO) frequencies. In OFDM systems, CFO destroys the orthogonality between subcarriers and causes intercarrier interference (ICI). To ensure good performance of OFDM systems, the CFO must be accurately estimated and compensated. For SISO-OFDM systems, periodic training sequences are used in [6, 7] to estimate the CFO. It is shown that these CFO estimators reach the Cramer-Rao bound (CRB) with low-computational complexity. A similar idea was extended to collocated MIMO-OFDM systems [8–10], where all the transmit antennas are driven by a centralized LO and so are all the receive antennas. In this case, the CFO is still a single parameter. For multiuser MIMO-OFDM systems, each user has its own LO, while the multiple antennas at the base-station (receiver) are driven by a centralized LO. Therefore, in the uplink, the receiver needs to estimate multiple CFO values for all the users. In [11, 12], methods were proposed to estimate multiple CFO values for MIMO systems in flat fading channels. 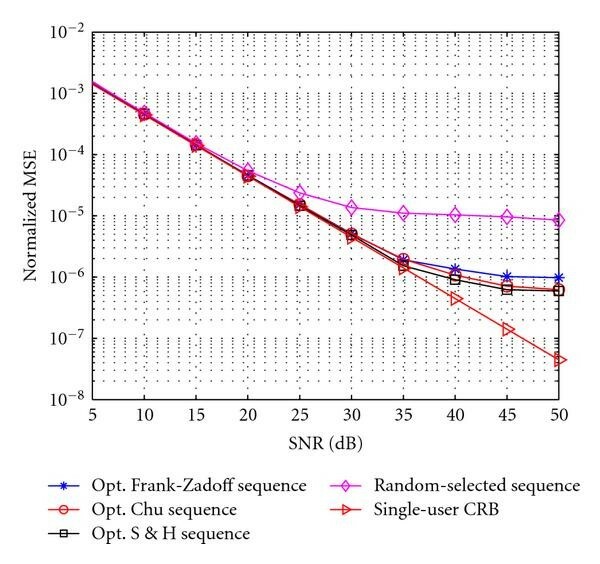 In , a semiblind method was proposed to jointly estimate the CFO and channel for the uplink of multiuser MIMO-OFDM systems in frequency selective fading channels. An asymptotic Cramer-Rao bound for joint CFO and channel estimation in the uplink of MIMO-Orthogonal Frequency Division Multiple Access (OFDMA) system was derived in  and training strategies that minimize the asymptotic CRB were studied. In , a reduced-complexity CFO and channel estimator was proposed for the uplink of MIMO-OFDMA systems using an approximation of the ML cost function and a Newton search algorithm. It was also shown that the reduced-complexity method is asymptotically efficient. The joint CFO and channel estimation for multiuser MIMO-OFDM systems was studied in . Training sequences that minimize the asymptotic CRB were also designed in . Polyphase Sequence by Sueshiro and Hatori (S&H Sequences) . Both Frank and Zadoff sequences and S&H sequences exist for sequence length of , where is the length of the sequence and is a positive integer, while Chu sequences exist for any integer length. For both Frank and Zadoff and Chu sequences, there are a finite number of sequences for each sequence length. Therefore, the optimal sequence can be obtained using a search among these sequences. However, for S&H sequences, there are infinitely many possible sequences. As the optimization problem for S&H sequences cannot be solved analytically, we resort to a numerical method to obtain a near-optimal solution. To this end, we use the adaptive simulated annealing (ASA) technique . For small sequence lengths, for example, and , we are able to use exhaustive search to verify that the solution obtained using ASA is globally optimal. (Because CFO values are continuous variables, theoretically, it is not possible to obtain the exact optimum using exhaustive computer search, which works in discrete variables. If we keep the step size in the search small enough, we can be sure that the obtained "optimum" is very close to the actual optimum and can be practically assumed to the actual optimum. In this way, we are able to verify the solution obtained by the ASA is "practically" optimal.) Computer simulations were conducted to evaluate the performance of the CFO estimation using CAZAC sequences. 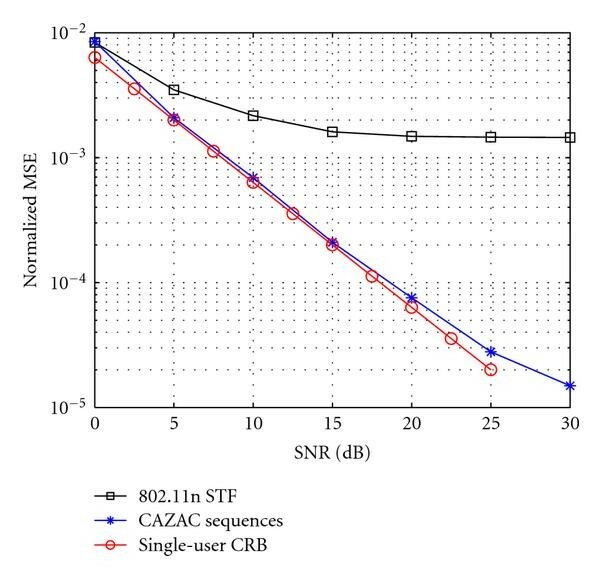 We first compare the performance using CAZAC sequences with the performance using two other sequences with good correlation properties, namely, the IEEE 802.11n short training field (STF)  and the sequences . The results show that the error floor using the CAZAC sequences is more than 10 times smaller compared to the other two sequences. Comparing the three classes of CAZAC sequences, we find that the performance of the Chu sequences is better than the Frank and Zadoff sequences due to the larger degree of freedom in the sequence construction. The S&H sequences have the largest number of degree of freedom in the construction of the CAZAC sequences. However, the simulation results show that they have only very marginal performance gain compared to the Chu sequences. This makes Chu sequences a good choice for practical implementation due to its simple construction and flexibility in sequence lengths. By using the identified optimal sequences, the error floor in the CFO estimation is significantly lower compared to using a randomly selected CAZAC sequence. The rest of the paper is organized as follows. In Section 2, we present the system model and derive the ML estimator for the multiple CFO values. The sub-optimal CFO estimation algorithm using CAZAC sequences is proposed in Section 3. The training sequence optimization problem is formulated in Section 4 and methods are given to obtain the optimal training sequence. In Section 5, we present the computer simulation results and Section 6 concludes the paper. where and superscript denotes vector transpose. The CFO matrix of user is denoted and is a diagonal matrix with diagonal elements equal to . We use to denote the transmitted signal matrix for the th user, which is an circulant matrix with the first column defined by . Here we assume so the channel vector between the th user and the th receive antenna is an vector by appending the channel impulse response vector with zeros. with being the channel matrix for the th user. The noise matrix is given by . and denotes the trace of a matrix. To obtain the ML estimate of the CFO vector , a search needs to be performed over the possible ranges of CFO values of all the users. The complexity of this search grows exponentially with the number of users and hence the search is not practical. where is the identity matrix of size . This means that is both a unitary (up to a normalization factor of ) and a circulant matrix. 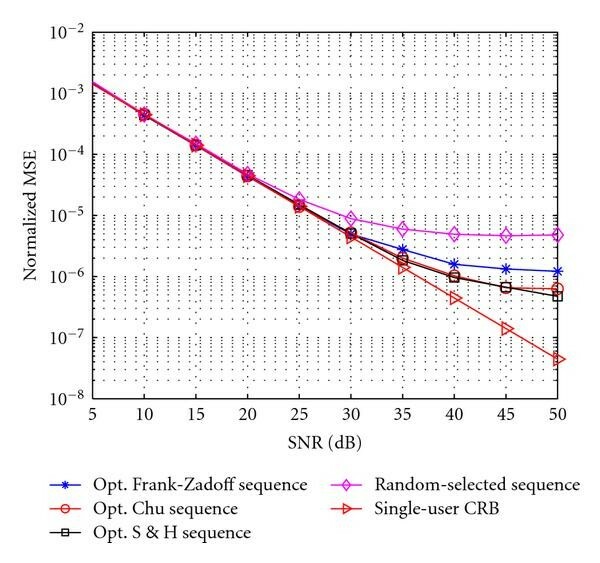 In , we showed that for collocated MIMO-OFDM systems, using CAZAC sequences as training sequences reduces overhead for channel estimation while achieving Cramer Rao Bound (CRB) performance in the CFO estimation. Here, we extend the idea to the estimation of multiple CFO values in the uplink of multiuser MIMO-OFDM systems. Let the training sequence of the first user be . The training sequence of the th user is the cyclic shifted version of the first user, that is, , where denotes the shift value. It is straightforward to show that the training sequences between different users have the following properties. where denotes a matrix which results from cyclically shifting the one elements of the identify matrix to the right by positions. Without loss of generality, we show how to estimate the CFO of the first user and the same procedure is applied to all the other users to estimate the other CFO values. Since same procedure is applied to all the users, the complexity of this CFO estimation method increases linearly with the number of users. Because is a matrix resulting from cyclic shifting the identity matrix to the right by elements, produces a matrix resulting by cyclic shifting the rows of by elements downwards. where denotes the angle of a complex number. The computational complexity of this estimator is low. We can see that the interference power is a function of the training sequence , the channel delay power profile , and the CFO matrices . In the previous section, we showed that the multiple CFO values destroy the orthogonality among the training sequences of different users and introduces MAI. In this section, we study how to find the training sequence such that the signal to interference ratio (SIR) is maximized. From the denominator of (23), we can see that the total interference power depends on the CFO values of all the other users. As a result, the optimal training sequence that maximizes the SIR is also dependent on for . In this case, even if we can find the optimal training sequences for different values of , we still do not know which one to choose during the actual transmission as the values are not available before transmission. This makes (23) an unpractical cost function. where is the complement of , that is, is the last rows of the identity matrix. From (27), we can see that the optimal training sequence depends on the power delay profile and the actual CFO value . The channel delay profile is an environment-dependent statistical property that does not change very frequently. Therefore, in practice, we can store a few training sequences for different typical power delay profiles at the transmitter and select the one that matches the actual channel delay profile. On the other hand, it is impossible to know the actual CFO in advance to select the optimal training sequence. In the following, we will propose a new cost function based on SIR approximation which can remove the dependency on the actual CFO in the optimization. The advantage of (31) is that the optimization problem is independent of the actual CFO value as long as the value of is small enough to ensure the accuracy of the Taylor's series approximation in (28). Notice that this is an unconstrained optimization problem and each element of the phase vector can take any values in the interval . From the construction of the S&H sequence , it can be easily shown that , where . Hence, from (32), we can get . By letting , the original optimization problem over the -dimension phase vector can be simplified to the optimization over a -dimension phase vector where . Number of possible Frank-Zadoff and Chu sequences for different sequence lengths. There are an infinite number of possible S&H sequences for each sequence length; it is impossible to use exhaustive computer search to obtain the optimal sequence. We resort to numerical methods and use the adaptive simulated annealing (ASA) method  to find a near-optimal sequence. To test the near-optimality of the sequence obtained using the ASA, for smaller sequence lengths of and , we use exhaustive computer search to obtain the globally optimal S&H sequence. The obtained sequence through computer search is consistent with the sequence obtained using ASA and this proves the effectiveness of the ASA in approaching the globally optimal sequence. where and represent the estimated and true CFO's, respectively, is the number of subcarriers, and denotes the total number of Monte Carlo trials. where is the SNR per receive antenna and is the number of subcarriers. From the results, we can see that the CFO estimation using the 802.11n STF has a very high error floor above MSE of . The performance using CAZAC sequences is much better. In low to medium SNR regions, the performance is very close to the single-user CRB. An error floor starts to appear at SNR of about 25 dB. The error floor is around 100 times smaller compared to the error floor using the 802.11n STF. MSE of CFO estimation using Chu sequences and IEEE 802. 11n STF for uniform power delay profile. The performance of the CFO estimation using the sequence and Chu sequence is shown in Figure 3. Here to satisfy the condition of , we use 15-tab multipath fading channels and the circular shift between user 1 and 2's training sequence is also set to 15. Again using CAZAC sequences leads to a much better performance. We can see that in low to medium SNR regions, their performance is very close to the single-user CRB. The error floor using CAZAC sequences is more than 10 times smaller than that using the sequence. Comparison of CFO estimation using Chu sequences and sequence for uniform power delay profile. The performance of CFO estimation using different CAZAC sequences is compared in Figure 4. Here we fix the sequence length to 36 and the multipath channel has tabs with uniform power delay profile. Comparing the performances of optimal Chu sequence and the optimal Frank-Zadoff sequence, we can see that the error floor of the Chu sequence is smaller. This is because there are more possible Chu sequences compared to Frank-Zadoff sequences and hence more degrees of freedom in the optimization. However, comparing the performance of optimal Chu sequence with that of the optimal S&H sequence, we can see that the additional degrees of freedom in the S&H sequence do not lead to significant performance gain. Compared to the performance using a randomly selected CAZAC sequence, we can see that the error floor using an optimized sequence is significantly smaller. Simulations were also performed in multipath channels with exponential power delay profile and root mean square delay spread equal to 2 sampling intervals. The other simulation parameters are the same as in the uniform power delay profile simulations. Simulation results in Figure 5 show again that the error floor in CFO estimation can be significantly reduced when using the optimized training sequence. Comparison of CFO estimation using different CAZAC sequences for channel for uniform power delay profile. Comparison of CFO estimation using different CAZAC sequences for channel for exponential power delay profile. From both Figures 4 and 5, we can see that the gain of using S&H sequences compared to Chu sequences is really small. Therefore, in practical implementation, it is better to use the Chu sequence because it is simple to generate and it is available for all sequence lengths. Another advantage of the Chu sequence is that the optimal Chu sequence obtained using cost function (31) is the same for the uniform power delay profile and some exponential power delay profiles we tested. Hence, a common optimal Chu sequence can be used for both channel PDP's. This is not the case for the S&H sequences. 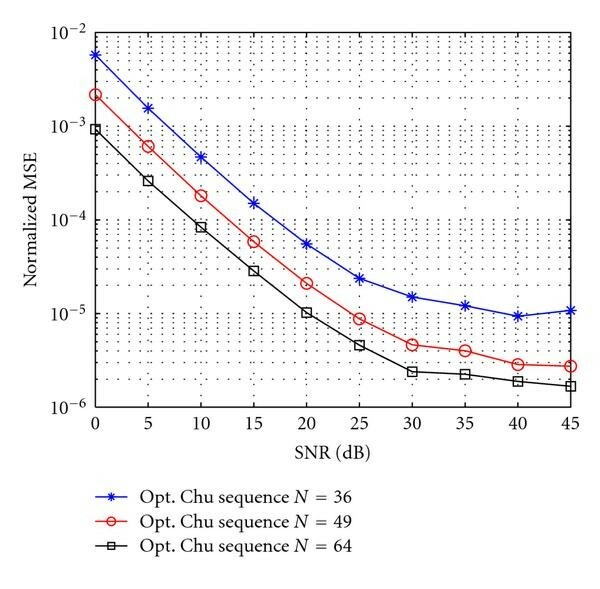 Figure 6 shows the performance of CFO estimation for different lengths of optimal Chu sequences. Here we fix the channel length to . From the previous sections, to accommodate two users, the minimum sequence length is . Therefore, we need Chu sequences of length at least 36. We compare the performance of the optimal length-36 sequence with that of optimal length-49 and length-64 sequences. For the length-49 sequence, the cyclic shift between training sequence of two users is 24, while for length-64 sequence, the cyclic shift is 32. From the comparison, we can see that there are two advantages using a longer sequence. Firstly, in the low to medium SNR regions, there is SNR gain in the CFO estimation due to the longer sequences length. Secondly, in the high SNR regions, the error floor using longer sequences is much smaller. This can be explained using Figure 7. In Figure 7, we plotted the signal power for user 1 and user 2 after the correlation operation in (15) for sequence length of 36 and 64. In the absence of the CFO, user 1's signal should be contained in the first 18 samples ( ). However, due to CFO, some signal components are leaked into the other samples and become interference to user 2. For the case of and , all the leaked signals from user 1 become interference to user 2 and vice versa. If we use a longer training sequence, there is some "guard time" between the useful signals of the two users as shown in Figure 7 for the case. As we only take the useful samples for CFO estimation (16), only part of the leaked signal becomes interference. Hence, the overall SIR is improved. The cost of using longer sequences is the additional training overhead that is required. Therefore, based on the requirement on the precision of CFO estimation, the system design should choose the best sequence length that achieves the best compromise between performance and overhead. Comparison of CFO estimation using different length of optimal Chu sequences for channel for uniform power delay profile. Comparison of useful signal and interference power for different sequence lengths (uniform power delay profile). In this paper, we studied the CFO estimation algorithm in the uplink of the multiuser MIMO-OFDM systems. We proposed a low-complexity sub-optimal CFO estimation methods using CAZAC sequences. The complexity of the proposed algorithm grows only linearly with the number of users. We showed that in this algorithm, multiple CFO values from multiple users cause MAI in the CFO estimation. To reduce such detrimental effect, we formulated an optimization problem based on the maximization of the SIR. However, the optimization problem is dependent on the actual CFO values which are not known in advance. To remove such dependency, we proposed a new cost function which closely approximate the SIR for small CFO values. Using the new cost function, we can obtain optimal training sequences for a different class of CAZAC sequences. 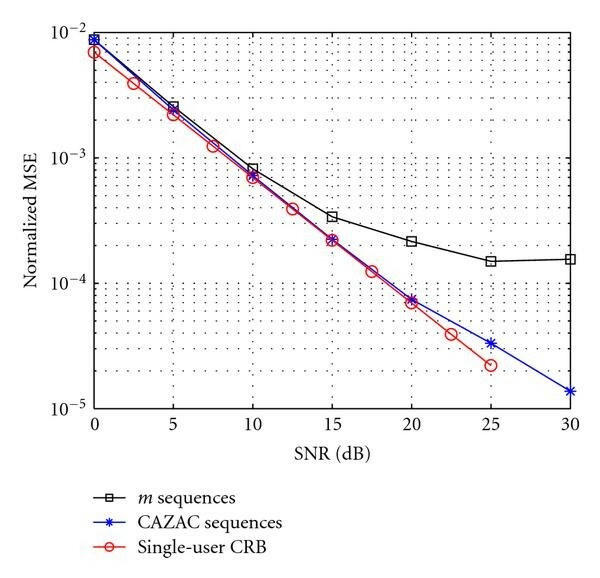 Computer simulations show that the performance of the CFO estimation using CAZAC sequence is very close to the single-user CRB for low to medium SNR values. For high SNR, there is an error floor due to the MAI. By using the obtained optimal CAZAC sequence, such error floor can be significantly reduced compared to using a randomly chosen CAZAC sequence. The work presented in this paper was supported (in part) by the Dutch Technology Foundation STW under the project PREMISS. Parts of this work were presented at IEEE Wireless Communication and Networking conference (WCNC) April 2009.